Implant denture-Have you lost multiple teeth struggle with a full denture? 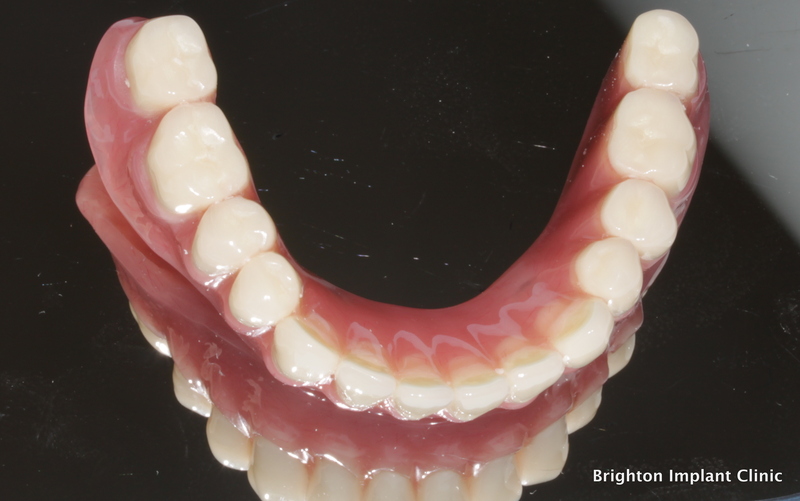 Unlike natural fixed teeth a full denture can be extremely difficult to cope with. Dentures are not attached to the jaw bone so tend to move around during function and speech. The upper denture covers the roof of the mouth and reduces the ability to taste food properly. The lower denture has little way to keep itself supported so it tends to move more than upper dentures. An implant denture or also known as an over-denture is a full denture that is supported and stabilized by dental implants. With implant dentures the dentures are still removable which facilitates cleaning. How do implant denture work? With an implant denture, support is provided by means of dental implants. A dental implant is a small titanium screw which is placed into the jaw bone to act as an artificial root. An implant can support a crown, bridge or implant denture. A specific abutment or interface is used on the implant in order to secure and stabilize the implant denture. The implant denture is clicked into precise position on the implants with the help of some force. The attachments provide strong retention which can be demonstrated when attempting to remove the implant denture. Usually there is less need for dental fixatives when having an implant denture. Another advantage is the total volume of the upper denture can be reduced by more than 50% with an implant denture. The ability to taste food properly is restored back to normal. For a lower implant denture, a minimum of 2 dental implants are needed while in the upper jaw a minimum of 4 implants are needed for an implant denture. How difficult is the surgery for an implant denture? Dental implant treatment is a safe and predictable treatment. More than 95% of all implant treatments are successful. Implant surgery is carried out under local anesthetic however sedation can be provided for anxious patients. The procedure usually takes less than a couple of hours to complete. A thorough examination needs to be carried out prior to surgery to ensure that adequate amounts of bone are present for implant placement. CT scans and radio graphs help the surgeon analyses the amount of bone available for implant placement. Once the surgery for an implant denture is completed, impressions can be taken of the mouth. 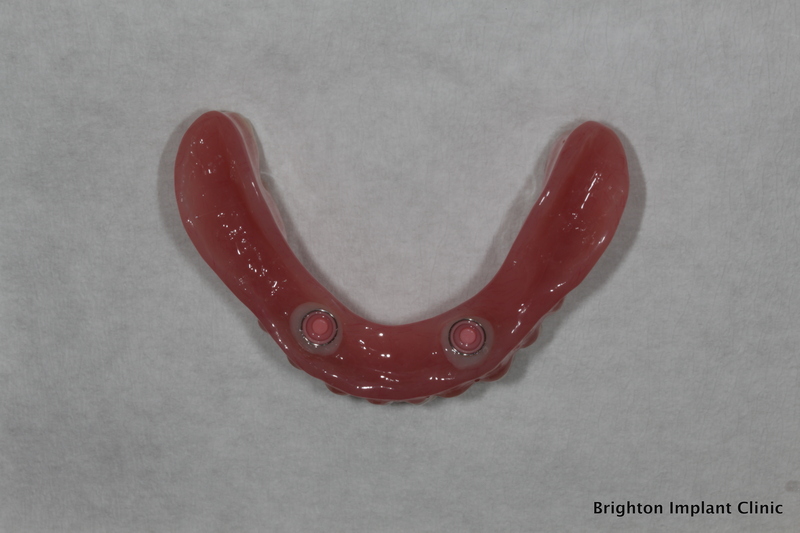 A dental technician will manufacture a new implant denture which will fit onto the implants. 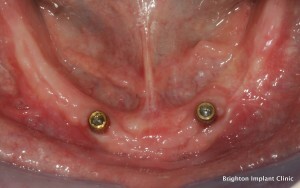 This treatment can be carried out in one day because of immediate loading. Immediate loading of dental implants refers to the procedure of inserting a dental implant and then attaching the corresponding prosthesis (implant denture in this case) in a single treatment session. Immediate loading of dental implants is a recent approach compared to the established standard of waiting for 2 to 6 months after an implant surgery before adding the permanent prosthesis. The main motivation for the development and promotion of the approach of immediate loading of implants is convenience, i.e., the drastic reduction of the length of time it takes for the patient to have functional replacement teeth. Some people who are in need of dental treatment consider “chair time” as a drain on their time and want immediate results. Immediate loading is not possible in all cases. Bone quality and quantity must be adequate for dental implant placement. How long does the whole treatment take to complete? With same day dental implant treatment, the implants are placed and teeth loaded on to the implants on the same day. The treatment however will still require some follow up visits. For four months after the implants are placed the bone tissue will grow around the implant and will create a very strong bond. This bone to titanium fusion is called osseo-integration. During the healing phase the original denture can be worn. After the healing period a new implant denture is made to fit accurately onto the implants and the surrounding tissue. 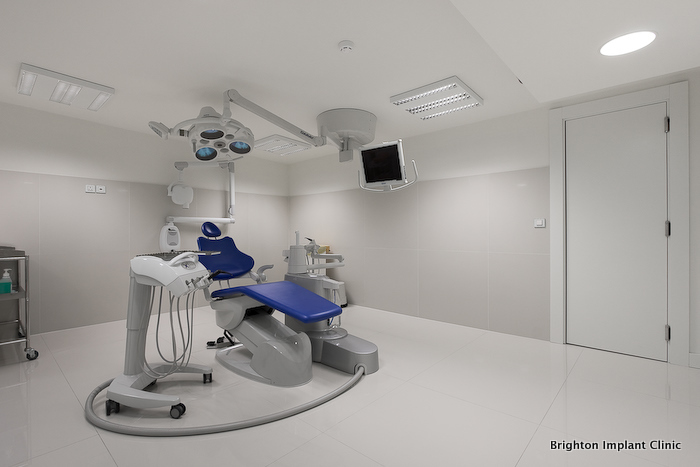 Brighton implant clinic is a clinic dedicated to providing dental implant treatment. Our surgeons are experienced in providing treatment for this type of implant denture. Our clinic has an in house 3D imaging CT scan which allows us to analyses the jaw bone prior to surgery. Our clinic also has its own in house dental laboratory which helps facilitate the implant denture process. For more information please feel free to Contact Brighton Implant Clinic or Call us on 0800 111 6623.